It is not a myth, Women really are better at multitasking, at least in certain cases. Modern, independent & workaholic… women have to struggle daily to cope with juggling priorities. Family life, long working hours, exciting social life and never forgetting to remove some time to take care of their body & skin. This week Avène celebrates womanhood by highlighting the 4 products from their dermo-cosmetic range for sensitive skin that will perfectly fit your busy life. Available in 2 sizes - 150ml and a travel friendly 50ml spray – this is the ultimate multitasker that will follow you every day! With soothing and anti-irritating properties, this Thermal Spring Water spray can be used on a whole range of skin ailments: use it on skin redness, to calm any irritation, following makeup removal, during travel or the hottest days of summer to cool yourself, post-shaving! Everyone needs some Avène Thermal Water at some point of the day! It removes make-up from the skin, lives your skin cleanse and fresh in a single step and doesn’t require rinsing. Especially suited for busy, pressed-for-time women like you, it gives your face softness and freshness with just one cleanse. Tip: Keep it in a handy place so you can use it quickly even if you’re very tired or sleepy! It erases, eliminates impurities and tightens pores, 3 moves in 1 for perfect skin! 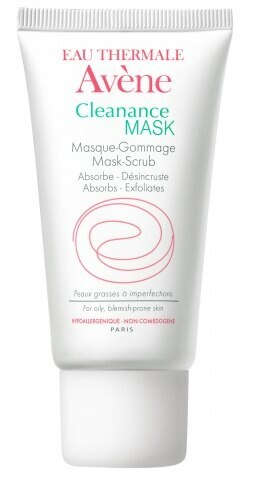 This multitasker can be used as a Mask and as an exfoliator. Used as a Mask, its soft clay absorbs the excess sebum and is combined with Glyceryl laurate which regulates the hyper-production of sebum, it leaves your skin shine-free. Whats is YOUR multitasking secret ?